Be the first to share your favorite memory, photo or story of Alva "Al". This memorial page is dedicated for family, friends and future generations to celebrate the life of their loved one. Alva B. “Al” Watt went to be with his Lord and Savior on Monday, February 4, 2019. He was a loving, humble and kind man, a true gentleman. He was described by a friend as the kindest, gentlest man I have ever known. He was a truly devoted and loving husband. 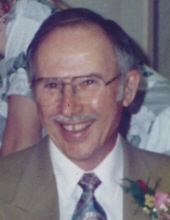 Al was born to parents Clida and Mae (Eccleston) Watt in Fowler, Kansas on October 31, 1921. He was the youngest of seven children. Al graduated from high school in Fowler, KS. He worked with one of his brothers in Arizona and later in a shipyard in San Francisco. Al entered the Army Air Corps, serving in Europe before being discharged in 1946. He returned to Arizona opening a services station in Tempe with his brother. Al retired from Santa Clara Transit in 1991. Al married Benny June Fimple. They lived in Redwood City, CA and the surrounding area. Benny died in 1989 in Sunnyvale. In 1992 he met and married Phyllis Harrison in Redwood City. They lived in Sunnyvale. The couple moved to Southern California in April of 1993. They relocated to Lynden in 2006. Al and Phyllis hosted Wednesday evening prayer meetings and a Sunday evening Bible study. Al is preceded in death by his parents, two brothers Lewis and Donald, four sisters Alma, Sylvia, Velma, and Della and two stepsons Christopher and Paul Beaulac. He is survived by his loving wife Phyllis, sons Sterling Watt and Roman Watt, step daughter Jacqueline McNabb, stepson Andrew Beaulac, 6 grandchildren, 9 great grandchildren, 13 step grandchildren, 13 step great grandchildren and many loving friends. The family will remember Al with a private family service at a later date. Arrangements are entrusted to Gillies Funeral Home and Cremation Services. To send flowers or a remembrance gift to the family of Alva "Al" Watt, please visit our Tribute Store. "Email Address" would like to share the life celebration of Alva "Al" Watt. Click on the "link" to go to share a favorite memory or leave a condolence message for the family.